I arrived at Finsbury Park station and found one there. 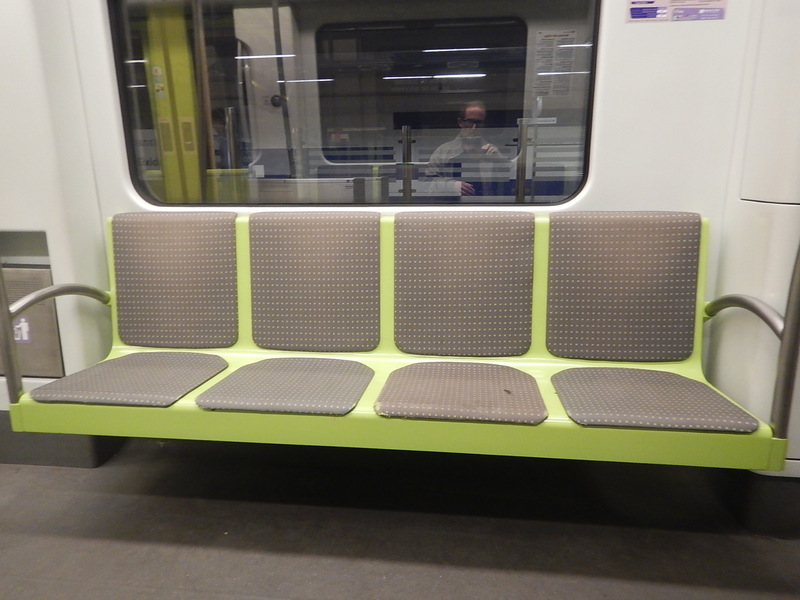 Would Batteries Help Voltage Change-over In A Dual Voltage Train Or Tram-Train? The Class 399 tram-trains in Sheffield can work on both 25 KVAC and 750 VDC overhead electrification. Their German cousins in Karlsruhe can work on both 15 KVAC and 750 VDC overhead electrification. In Karlsruhe, there is a ceramic rod between the two overhead cables with different voltages and the pantograph rides across. I suspect that clever power electronics on the tram-train measures the voltage and converts it automatically to that needed to power the tram-train. I haven’t been able to see how Sheffield connects the two different voltages, but I wouldn’t be surprised if a similar system with a ceramic rod is used. 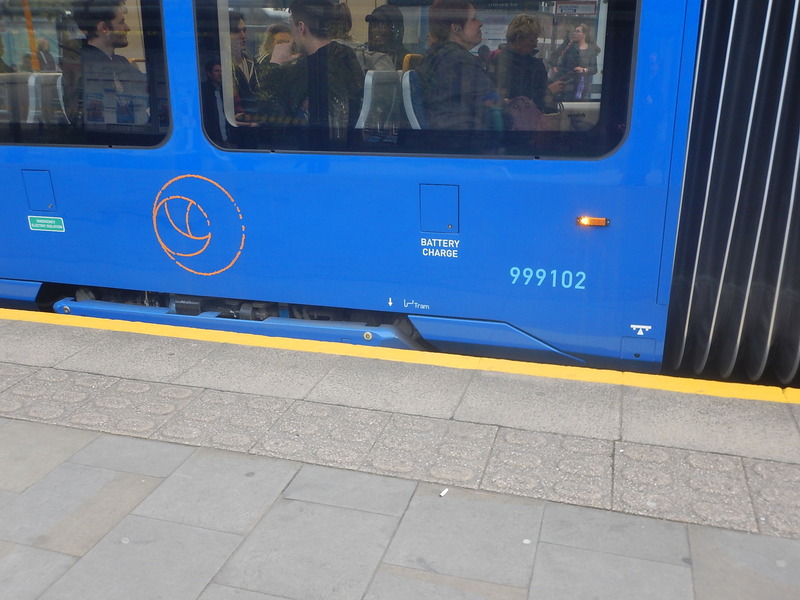 Look at this picture, I took of a Class 399 tram-train in Sheffield. Note the BATTERY CHARGE socket to the left of the car number. Why would an electrically-powered vehicle need a battery? I suppose it could be to start up the tram-train in the morning and raise the pantograph. But could it also be for emergency power, to move the tram-train short distances, such as in depots or to assist the vehicle through the dead sections, where the power supply changes from one voltage to another? The Class 399 tram-trains ordered for the South Wales Metro will also have to cope with discontinuous electrification. So is the technology needed for this already installed in the tram-trains in Sheffield? Suppose you have a train like a Class 378 or Class 700 train, that can run on both 25 KVAC overhead and 750 VDC third-rail electrification. Third-rail trains with contact shoes deal with discontinuous electrification all the time. If a dual-voltage train had a battery that could take it say two hundred metres, then I believe that voltage changeover could be simplified and speeded up. I have watched Class 717 trains change voltage at Drayton Park station and what changes would a limited battery capability make. The third-rail electrification would stop several metres short of the station and would be removed in the station itself. Going towards Moorgate, this would be the procedure. The train would stop in the station as it does now. The driver would drop the pantograph, whilst passengers unloaded and loaded. The driver would close the doors. The train would accelerate away on battery power. After a few metres the train would contact the third-rail and the train’s computer would change from battery to third-rail power. Going away from Moorgate, this would be the procedure. The train would automatically disconnect from third-rail power, where that stopped to the South of the station. The train would automatically switch to battery power. The driver would raise the pantograph, whilst passengers unloaded and loaded. The train would accelerate away on overhead power. The stops should be no longer, than a normal station stop without power changeover. 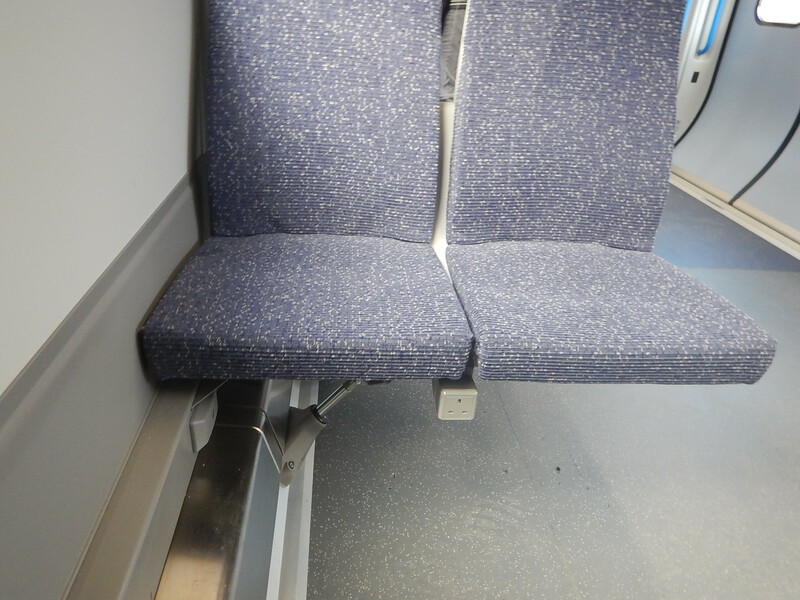 In A First Ride In A Class 717 Train, I didn’t take any pictures of the power sockets, as I didn’t see them. This picture from a second trip, rectified the error. There is one 13 amp socket under a pair of seats and you will need a plug. It is my belief that a USB socket is better, as this armrest installation on a Class 230 train shows. It is certainly a better place, as the wires can be short and can be kept out of the way. The wi-fi performed well, but Great Northern seemed to want me to register. I never do, as it just gives them an excuse to send you junk mail. The wi-fi installation can be improved. It has to, as according to this article on Rail Magazine, Class 710 trains have USB sockets. My ideal train would have. Free wi-fi with no registration. USB sockets in the armrests. 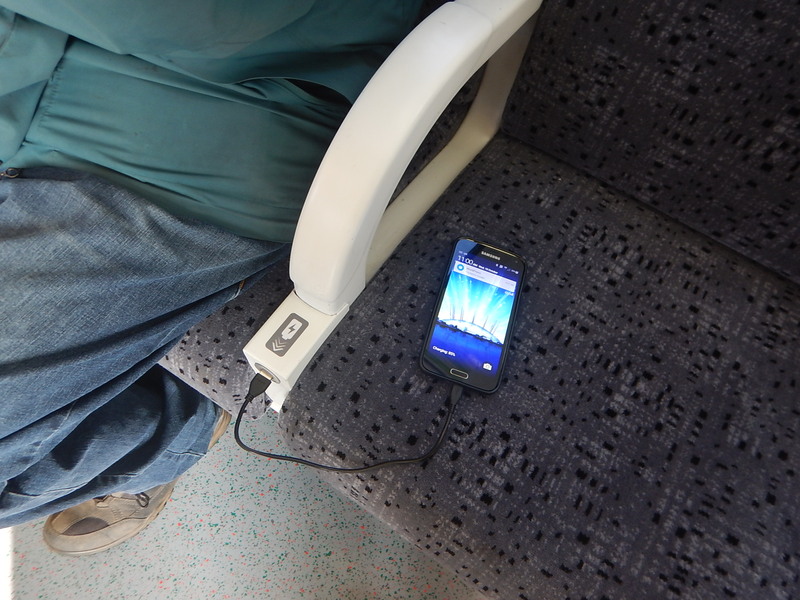 4G booster, so if the train has a signal, you do. The current systems can be greatly improved. I walked the length of a Class 717 train and noted the various plates. The formation was as follows. Totalling these up and adding other details gives. This article on Rail Magazine has this paragraph. Each ‘717’ has capacity for 943 passengers, for which there are 362 seats (including 64 priority seats and 15 tip-ups). Assuming that each passenger weight 80 Kg with bags and buggies, this gives the following. A passenger weight of 75.4 tonnes. A train weight of 280 tonnes. This figure would probably mean that batteries could be fitted to these trains to handle regenerative braking. 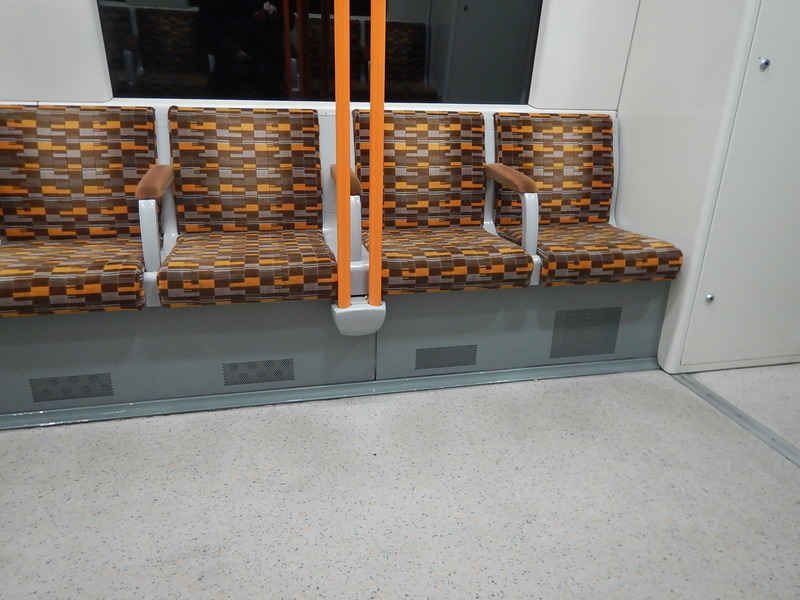 I was talking to a station guy on the Gospel Oak to Barking Line yesterday and he told me, it will be two weeks before the new Class 710 trains start running. 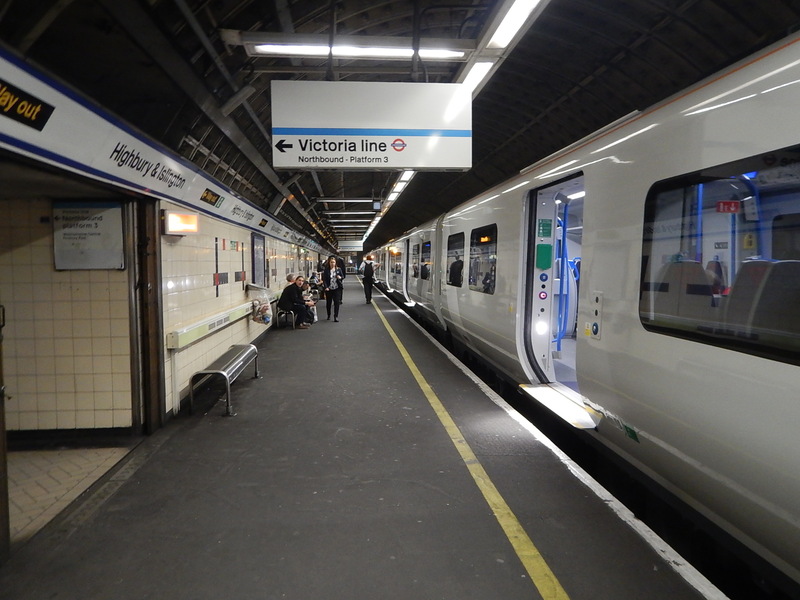 He indicated that the Class 378 trains don’t fit the route, which I do find strange, as the Class 710 and Class 378 trains should eventually be sharing the North London Line. According to Wikipedia widths of the trains are as follows. Class 172 – 2.69 m.
Class 378 – 2.80 m.
Class 315 – 2.82 m.
By comparison a Class 345 Aventra is 2.78 m.
Perhaps that twenty millimetres is critical!. But the guy had a point, when he suggested the line should have had a slightly larger gauge,, as it might have been possible to run a few redundant Class 315 trains on the route. A couple of weeks ago, I heard a rumour that the Class 717 trains didn’t fit the tunnels into Moorgate. It sounds like there has been a lack of people, who can read a tape measure.